What are priests and deacons? 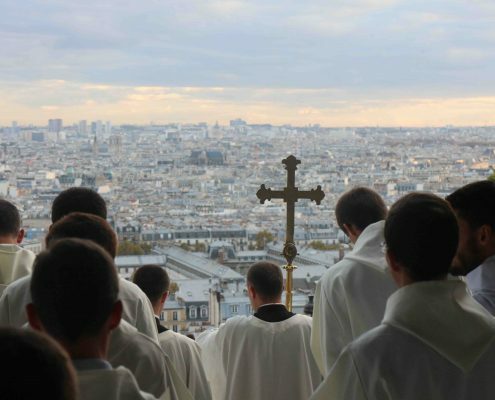 On Friday November 4, the seminarians and the priests in charge of the formation went to Paris in order to celebrate the 1700 years anniversary of the birth of Saint Martin, as well as the 40 years anniversary of the birth of the Community of Saint Martin. 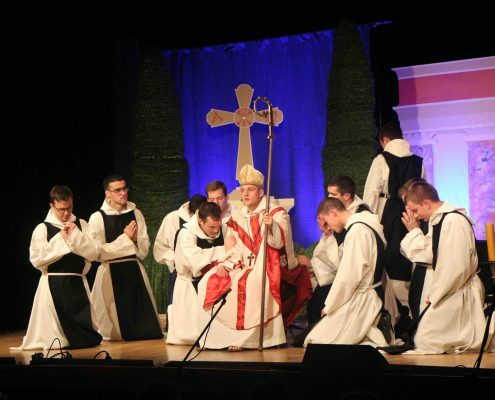 The celebrations began, at the youth pastoral center Bon Conseil, with the performance of the theatre “Saint Martin the Merciful”, written by the seminarians. This premiere was reserved to all those persons who have faithfully supported our Community. The following day, after having passed through the holy door of Mercy, a Mass of thanksgiving was celebrated at the basilica Sacré-Cœur de Montmartre, presided by don Paul Préaux, General Moderator, surrounded by around twenty priests of the Community. This place of perpetual adoration is dear to the Community of Saint Martin – “it was born by the eucharistic adoration of Abbé Jean François Guérin and the numerous young people who accompanied him”, as don Paul recalled during his homily. On Saturday evening, another performance of “Saint Martin the Merciful” was given for families and friends. Finally, everyone was reunited to celebrate Sunday Mass at the Community’s church Notre Dame des Blancs Manteaux, in order to close this magnificent weekend.